XM Studios is proud to present the Marvelous Female Powerhouse, Ms Marvel! 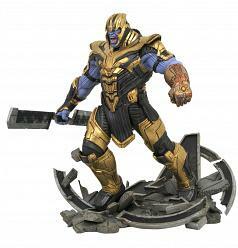 One of the strongest Heroines in the Marvel Universe, her beauty and power is brought to life in an incredibly detailed 1:4 scale cold-cast porcelain format. 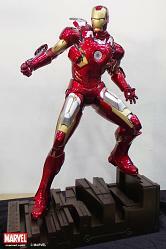 Each painstakingly handcrafted statue stands at approximately 22 inches tall and every piece individually hand-painted with the highest possible finish. In an action pose bursting out of a battle-ravaged tank debris which is designed to go well with our upcoming She-Hulk, you can also switch between ClassiThe Ms Marvel Premium Collectibles statue features: Approximately 47cm tall (head to toe) Crafted from cold-cast porcelain Two (2) interchangeable portrait for alternate display. Art print specially designed by Stanley Lau Limited edition : 700 Artists: Imaginary Friends Studios (Design and Concept) Suheryanto Hatmaja (Sculpt) XM Studios Design and Development Team Manufactured by: XM Studios Product size : 56cm H X 30cm L X 24cm B Est. Box Size : 68.5m H X 49.5cm L X 37cm B (estimate) Est. Product Weight : 6kg (estimate) Est. 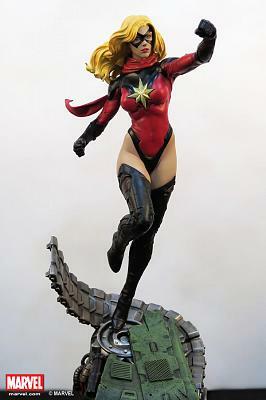 shipping weight : 11kg (estimate)c Crop or Luscious Long Golden Locks for the Ms Marvel look you prefer!